As mentioned previously, I love a nice package. Oh, the stories I could (and will) tell about nice packages. 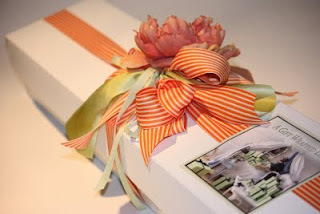 While you're waiting for those, please visit A Gift Wrapped Life for instructions on how to make your package beautiful. To celebrate the opening of her new store, Sande (author of the blog) is having a giveaway of her extremely pretty package-preening products. Look at the packaging in the picture above! Puh-retty. Thanks for the birthday wishes. Also, when you get a second, can you email me with the info you'd like on your luggage tags?